Swim ‘n’ Sing Turtle hums and gargles as he goes around the bath tub! Makes an ideal companion for Splashy the Penguin (sold separately). 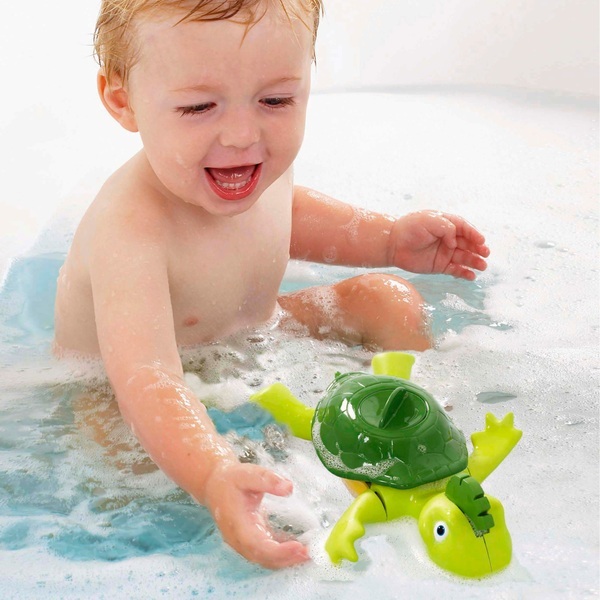 Watch Tomy Swim & Sing Turtle swim in the bath. It’s great for introducing your little one to movement in water. Wind up the dial on his shell to make his arms rotate so he swims and press his head to make him hum. He hums the tune "Beautiful Blue Danube" when swimming on his back and gargles the tune when swimming on his front. EU Warning: Not suitable for children under the age of 12 months. Never leave child unattended.